A thriving small business needs storage that can thrive with it. 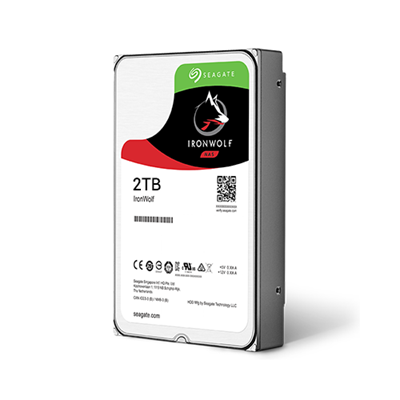 The Seagate ST2000VN004 IronWolf 2TB SATA Hard Drive is optimised for NAS in multi-RAID environments that not only handle the vibration, but also handle the high user workload rate in a high data traffic network. With this Seagate ST2000VN004 IronWolf you can get used to tough, ready and scalable 24×7 performance that can handle multi-drive environments with a wide range of capacities. •	Optimised for NAS with AgileArray. AgileArray is built for dual-plane balancing and RAID optimisation in multi-bay environments with the most advanced power management possible. •	High performance means no lag times or downtime for users during high traffic time for the NAS. Highest performance in NAS-class drives. •	More capacity options mean more choices that will ¬ fit within the budget. Seagate provides a scalable solution for any NAS use-case scenario. •	Get ahead with more cache. IronWolf provides high-cache options allowing your NAS to serve data faster. •	Do more with multi-user technology. Multiple users can confidently upload and download data to the NAS server, knowing it can handle the workload, whether you're a creative professional or small business. •	Designed for always on, always accessible 24×7 performance. Access your data on your NAS any time, remotely or on site.